Bookwalter was in England this summer on the trail of Poirot. In the 1990s, the BBC filmed the Poirot Mystery series based on the Agatha Christie novels of the same name. The full series was shown on Oregon Public Broadcasting (OPB) and occasionally still surfaces in re-runs. Hercule Poirot was a comically suave Belgian detective with a razor-sharp analytical mind. He solved the thorniest of murder cases without mussing a hair on his trademark handlebar mustache. Well-known actors such as Peter Ustinov and Peter Finch have played the part of Poirot at one time or another in their careers. But the BBC’s David Suchet is for most people the definitive Hercule Poirot. The De La Warre Pavillion at Bexhill-on-Ocean designed by Erich Mendalsohn in 1938. The setting for the series is the glamorous world of Art Moderne London in the 1930s. Art Moderne was an artistic movement that emphasized streamlined styling, images of speed, and rounded, flowing lines. Many architectural historians consider Moderne to be an outgrowth of the more angular and ornate Art Deco style of the 1920s. Others say its exact origins are unknown. In any case, Hollywood takes the credit for broadcasting the style to the world. It is ironic then that the U.S. ended up building so comparatively few Moderne structures. 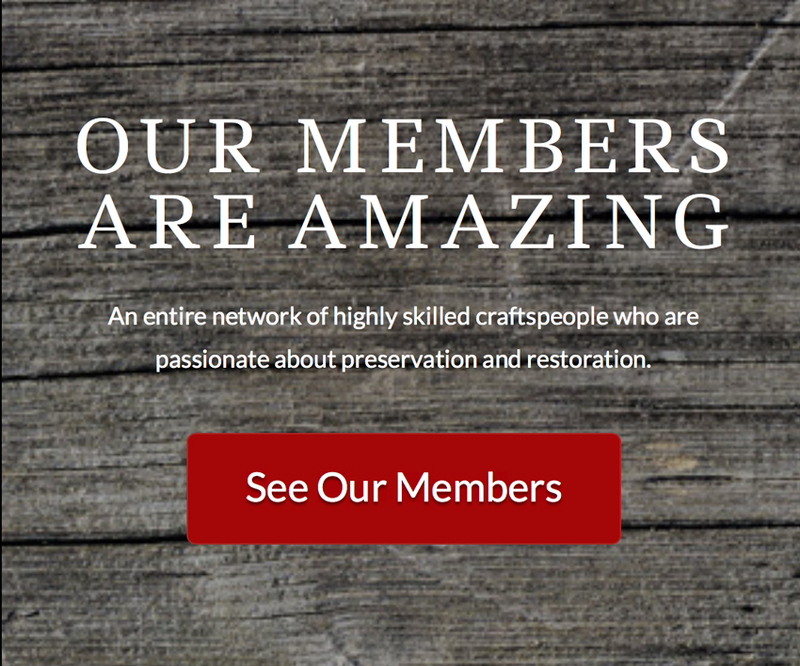 The Great Depression severely curtailed our building output for the whole 1930s decade. The city with perhaps the largest concentration of Moderne buildings is London. It is within this Moderne fairyland of the 1930s that the Poirot mysteries weave their complex and not-so-streamlined plots. Most American viewers probably assumed such displays of glamorous consumption were a complete fairy tale of the Depression-weary 1930s. Not necessarily. The United Kingdom was not impacted by the Great Depression as severely as the U.S. Though industrial and mining areas of Northern England and Wales were as devastated as their U.S. counterparts, the English Midlands and the South (particularly London) saw the 1930s as a period of relative prosperity and growth. New suburban areas boomed as the London Underground transit system pushed further and further into the hinterland. Between 1930 and the eve of World War II in 1939, an incredible four million new homes had been created in Britain. By 1939, fully one-third of the population was living in a home less than 10 years old. It had taken the country at least a decade to recover from the devastation of the First World War. But now Britain at the dawn of the 1930s was not going to let a minor annoyance like the Great Depression stand in its way. Perhaps at least one-half of all this housing built in the 1930s had some design features that are considered Moderne today: curved streamlined corners, curved metal casement bay windows (known as “sun-catchers ”) streamlined metal railings on balconies and sundecks, all white façades in stucco or concrete, and horizontal banding on the façade. Some daring builders went extreme and built completely flat roofs on their homes. A safer alternative in Britain’s rainy climate was to build a flat-topped parapet that hid the pitched roof behind it. 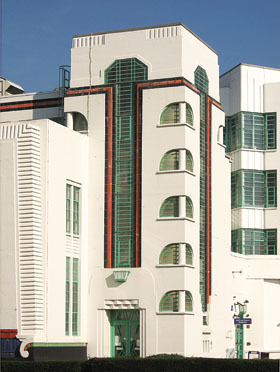 At least one Poirot episode was filmed at London’s Hoover Building on the Great Westen Road. This 1933 building combines earlier art deco motifs with 1930s Streamlined Moderne styling. And yes, they did manufacture vacuum cleaners at this plant. To get a good viewing of 1930s British Moderne housing, one need only to take a ride on the London Underground rail system in any direction away from the central city. The underground soon becomes overground and passes through the extensive inner ring of 1930s suburbs. As a bonus, one can view the Moderne train stations built along with the houses. Almost all of these have been preserved in their 1930s appearance. Back in 1930s Central London, vacant and under-utilized sites were re-developed with Moderne flats, restaurants, theaters, and department stores. This is the London that Poirot inhabited. Poirot’s fictional address was Flat 4G, Whitehaven Mansions (tall apartment blocks are often called “mansions” for some reason.) In reality, the building used in the series is known as Florin Court and is located on Charterhouse Square. The 1930s also saw a boom in new central city department store construction. Snazzy Moderne styling helped lure in the young and free-spending workers of the “new economy” (communications, airplanes, pharmaceuticals, and engineering). Poirot’s impeccable good taste would have certainly led him to such stores as Selfridge’s, David Jones or Barkers of Kensington. Today, these same stores still retain their Moderne good-looks (at least on the outside). The customer base has changed over the years, however. Shoppers filling the aisles today are frequently global, often flush with newly earned petrodollars. Portland, OR, is not without its good examples of Art Moderne. But, like the rest of the country, the Depression significantly reduced building activity in the 1930s. World War II decreased construction even further. And the Post-War period looked askance at anything connected to Art Deco. Moderne was replaced by Modern and characters like Poirot faded into the pages of yesterday’s detective novels. Many Moderne department stores were built during the 1930s throughout London. Shown above is Barker’s of Kensington. But what’s old has become new again. Many new apartment blocks in London are being built in a Neo-Moderne fashion. Perhaps the near-cult following of the BBC’s Poirot Mysteries has played a role in the style’s revival? Portland has seen some interest in Neo-Moderne as well. More than a few large condo projects in the Pearl and elsewhere are showing a definite preference for streamlined features. International economic forecasters are predicting a steep decline of construction on both sides of the pond. Whether this nips the Neo-Moderne Revival in the bud remains to be seen. I have a strong suspicion that the famed stiff-upper-lip attitude of the British will allow them to carry on as usual, thank you. After all, they didn’t let the Great Depression rain on their parade in the 1930s. What’s a little credit crunch compared to that?